Adversity is inevitable. You can’t control whether you experience it, but you can lay down the need for control and, in doing so, learn to respond to it properly. It’ll be easier if you respond with love and openness, and it’s funny how a simple shift in perspective births such a profound shift in consciousness while making life infinitely more joyful. If you can be open to what your path has for you and willing to go with the flow while going out of your way to take opportunities and create new experiences, you can get the most out of your life without forcing the experiences you want. 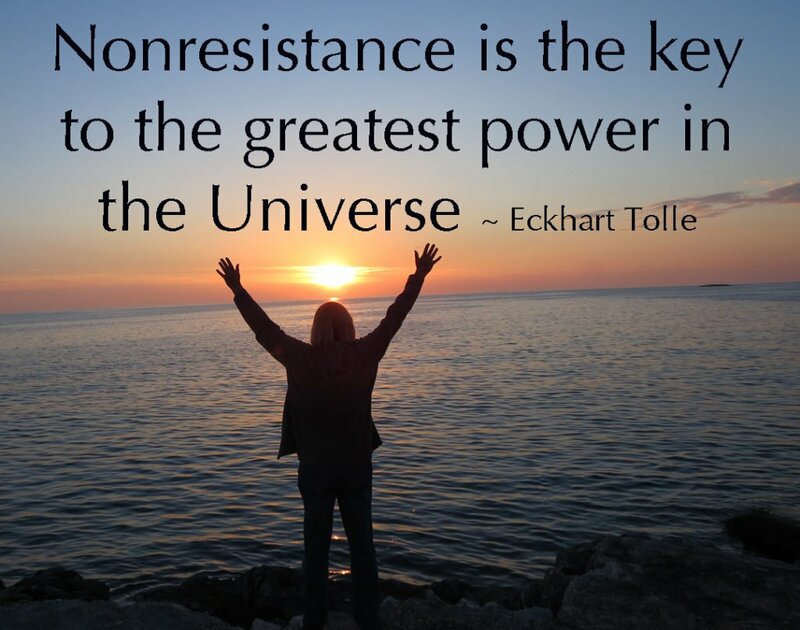 Releasing resistance, which includes the need to control your life, could very well be the key to enlightenment or creating the life you deserve. It’s a simple concept, but acting on it can be difficult. Paul Ferrini outlines the ‘one supreme addiction’. “You think you are the doer of your life and that you have created safety, when in fact your life is about to explode and you are about to realize that you have no conscious control over what happens. You believe that you are powerful, yet you demonstrate again and again your utter powerlessness. “This is an interesting paradox, is it not? No matter how hard it tries, the ego cannot create safety. No matter how many times the ego tries to push you out of the present moment, it inevitably brings you into it full force, because the price of denial is pain. “The more you seek to control life the more life will give you the message that it cannot be controlled. And then you will feel powerless and try even harder to control. You see! It is a silly game. You cannot win the game, yet you can’t stop playing it either. This is the one supreme addiction. Adyashanti describes the secure position from which the mind attempts to operate. “Life moves, undulates, breathes in and out, contracting and expanding. This is its nature, the nature of what is. Whatever is, is on the move. Nothing remains the same for very long. Beyond the limited self and the ego that keeps it in motion is pure awareness. “The mind seeks to nail life down and get it to stop moving and changing. When this doesn’t work, the mind begins to seek the changeless, the eternal, something that doesn’t move. But the mind of thought is itself an expression of life’s movement and so must always be in movement itself. “When there is thought, that thought is always moving and changing. There is really no such thing as thought. There is only thinking, so thought which is always moving (as thinking) cannot apprehend the changeless. Many spiritual people, Adyashanti writes, are violent to themselves. “Spiritual people can be some of the most violent people you will ever meet. Mostly, they are violent to themselves. Few seekers are ‘truly free’ because most conform to ideas and beliefs. “Why is it that so few people are truly free? Because they try to conform to ideas, concepts, and beliefs in their heads. They try to concentrate their way to heaven. To take Adyashanti’s advice and ‘step backward into the unknown’ is to relinquish the control over your life you’ve struggled to maintain since day one, and you’ll feel a supreme sense of relief when you finally let go of it. As you slowly release your grip on life, you’ll finally begin to see clearly. Most of us, including me, have yet to let go of it completely. It helps to have guidance from spiritual teachers who are aware of the difficulty of detaching from the known, but ultimately, it’s a personal process that requires deep soul searching. Meditation and other forms of consciousness expansion reveal vibrant states of being beyond the chatter of the mind, and the need to control life will fade along with the chatter and resistance that once seemed impossible to transcend. You’ll know without a doubt you’re connected with something much greater than the physical world, and openness to this cosmic consciousness will help you release the rest of your resistance and welcome the lessons placed on your path. Paul Ferrini, Silence of the Heart. South Deerfield, MA: Heartways Press, 1996, 28-9. Adyashanti, “Only Awareness Remains,” 2003, downloaded from http://www.adyashanti.org, 2004. Adyashanti, “Selling Water by the River,” Inner Directions Journal, Fall/Winter, 1999, downloaded from http://www.adyashanti.org, 2004.